Contrary to popular belief, solar panel installation is actually an extremely simple process – all you need is the right team to perform it. 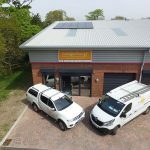 Our band of professional workmen can set up your Solargen system in four simple steps: surveying your property, providing a quote, fitting the panels, and conducing a final safety check. The installation of the panels themselves rarely takes longer than a day to complete and can be performed with minimal disruption. In most cases, your Solargen system can be set up in less than 48 hours. Simple. Solar panels have the ability to increase the value of your property, meaning you can make a profit on your home should you ever decide to sell it on. Any home with a built-in solar energy systems offers homebuyers a great incentive because it gives them the opportunity to save money on their energy bills and even profit from selling excess energy back to the National Grid in the future. Solargen systems are also designed to the highest possible standard and can actually enhance the appearance of a property in a modern world where people are constantly on the lookout for “green” buildings. Studies have shown that buyers are willing to pay more for a home with solar panels already fitted, so if you’re planning on selling your home a few years down the line, a Solargen system could prove to be a worthy investment. The beauty of solar panels is that they do not demand constant attention. After the initial installation, they require minimal upkeep and often function all year round without any real difficulties. All the panels used by Solargen are of an exceptionally high quality – resilient, strong and resistant to wear and tear. The inverters (the mechanisms on panels that actually convert solar energy into electricity and heat that your home can use) on our systems also come with a Five Year Warranty as standard, meaning any repairs conducted in this time period will be completely free of charge. Solargen systems are also built with durability in mind and can operate effectively at full capacity for decades without regular maintenance being required. Relying on solar energy to power your home also protects your property from any sudden electricity price surges that can see energy bills skyrocket. Whilst the cost of electricity is always subject to change, you can’t put a price on sunshine, and utilising solar energy can help you save hundreds of pounds on your energy bills in the long run. Having a Solargen system in place is ultimately one of the best ways to make your home as cost-efficient as possible. Did you know that utilising solar energy can actually make you money? The UK government’s Feed-In Tariff scheme awards homeowners who generate their own electricity through use of renewable energy power systems by paying them a standard rate. These payment rates are under regular reassessment, with the latest figures available here. Currently, the government’s Feed-In Tariff pays homeowners for generating solar energy twenty years from the point at which they first install their solar panels. Two decades’ worth of solar energy production may lead you to a tidy profit. If the solar panels on your roof generate more electricity than you need to power your home, you can actually sell this excess electricity back to the power grid. Not only does this help the National Grid continue their work in supplying buildings and locations all over the country with power, it also allows you to rake in some extra pocket money on any of the power you do not use yourself. With a Solargen system and a bit of guidance from our knowledgeable team, you can turn your household into a profit-generating machine. Another key benefit of having a Solargen system in place is the fact that you will instantly become more environmentally friendly. Lowering your carbon footprint is more important than ever these days. By utilising solar power, you are doing your bit for Mother Earth and actively contributing to the mission to save the planet – creating an increased amount of jobs in the solar energy sector in the process. It may sound a little dramatic, but it’s true. The more people who utilise renewable energy and have Solargen systems in place, the longer Earth will be a safe place to live. By investing in a Solargen system, you are readily embracing a new era in UK energy. Solar power has now eclipsed coal as a major generator of the country’s electricity, demonstrating the rising awareness in climate change concern and a national desire to turn green. By utilising solar energy today, you can become a part of this exciting new era for Britain and ensure you receive maximum benefits in return from the energy grid. Solar energy is the future, and by installing a Solargen system you can avoid being a homeowner who’s left behind using archaic, cost-draining forms of energy production. If you’re interested in changing your home and lifestyle for the better forever, give Solargen Energy Ltd a call today on 0800 1123571, or drop us a line on info@solargenenergy.co.uk. We can help you to transform your residence into a property that’s environmentally-friendly, cost-efficient and extremely comfortable.